Dynamics GP Land: Another Day. More Convergence. Another long couple of days here in Atlanta, but good ones. Started out Tuesday with attending an interactive discussion on creating and deploying custom reports. It is always great to hear the fabulous things that customers and partners are doing with the variety of tools we now have available to us (SQL Reporting Services, Management Reporter, Report Writer, Word Templates, SmartList Builder, Excel Report Builder, SQL Analysis Services....etc etc etc). I then headed on over to check out a session on AX and Sure Step led by Chandru Shankar, Architect of Microsoft Dynamics Sure Step. It was great to see a packed session, and lots and lots of questions for Chandru and his fellow presenters afterwards. Then it was off to work in the Hands on Labs. We had some great content this year, including guided and recorded demos using the Demomate technology. Attendees can get more info on these demos by emailing info@demomate.com. I have also received word that the self-paced lab manuals will be available on the Virtual Convergence site in the coming days. In the GP world, we had some guided labs on R2 (coming up for release in May) as well as some great content on GP 2010 and SQL Reporting Services. As a person who learns best by doing, I love these resources. Customizable email messages with variables-- so now when emailing a customer their invoice, you can reference the number in the email body! Very cool. Business Analyzer-- Desktop display of SQL Reporting Services, a bunch of new standard reports/metrics for us to play with! And even the ability to link metrics in to the Navigation Lists within Dynamics GP. Pick vendor(s) in a list, and dynamically see the metric update! Word templates for all-- the new World template tool (emphasized to be a technical developer tool, not an end user tool) allows you to create a word template out of any GP report. Wowza! Interested? See more cool new features in GP 2010 R2 by checking out the "Feature of the Day" on the Inside Microsoft Dynamics GP blog. So Tuesday concluded with a relaxing dinner and a drink with an old friend, and then back to the room to finish up email for the day/night. Wednesday began way too early with a trip over to the conference center early to finish up some labs before the keynote. I was very excited to see Malcom Gladwell speak, since I am a fan of his books. As usual, he dove in to the details of the real influences on everyday events like ballgames and the perceived home field advantage. Sadly, I had to break out early to head over for my final shift in the labs. There was definitely a brisk business when the labs opened, from attendees wanting to "fuel up" on knowledge before heading home. Popular topics this year-- Management Reporter, Workflow, Business Analyzer, and definitely SQL Reporting Services. 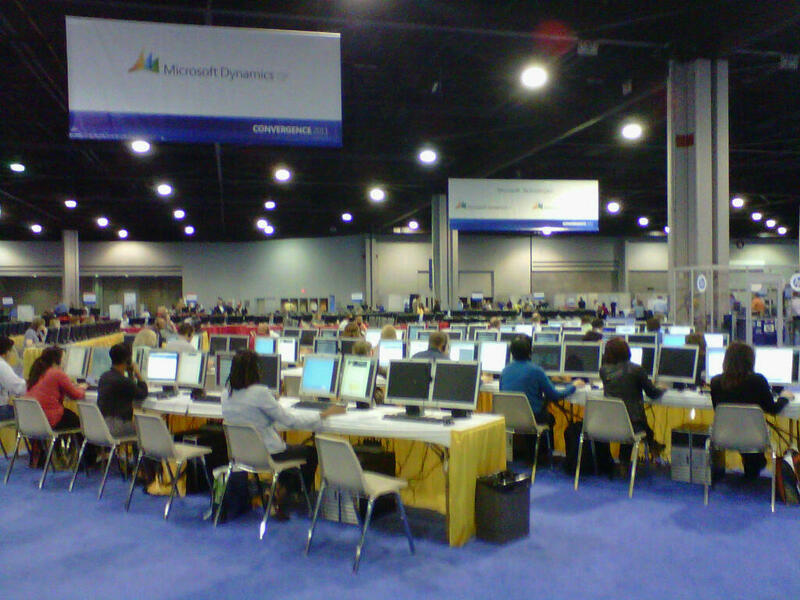 I also saw a number of folks who were looking for labs on PowerPivot (which we had in the Office lab area). Shift done. Goodbyes done. Off to lunch and airport. Now on flight home (dontcha love inflight internet). Wishing everyone safe travels home today and tomorrow. It's been a great conference. See you next year in Houston. Christina Phillips is a Microsoft Certified Trainer and Dynamics GP Certified Professional. She is a supervising consultant with BKD Technologies, providing training, support, and project management services to new and existing Microsoft Dynamics customers. Use Tax and Dynamics GP- Match Made in Heaven?